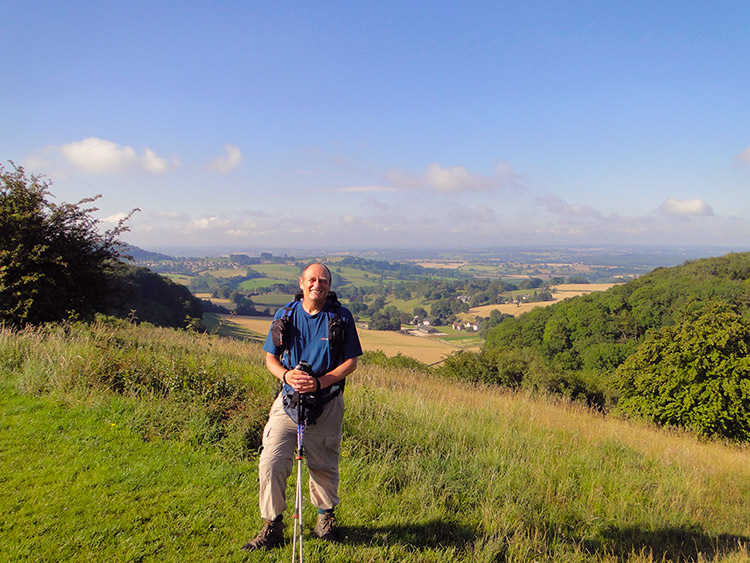 The fifth of my seven days on the Cotswold Way phase of the Great British Walk would be the last spent on the higher Cotswold Hills escarpment ridge which becomes narrower, lower and less defined after Hawkesbury Upton. Still this last of the higher Cotswold Days was a fitting finale to the big hills of the region which saw my climb from Dursley to Stinchcombe Hill before crossing the Doverte Gap to the village of North Nibley from where I made a climb to Nibley Knoll, home of the Cotswold Way's grandest monument. From there I followed the ridge line south and past a hill fort before descending to Wotton under Edge. A third long climb of the day followed to Blackquarries Hill and on to Wortley Hill before I descended to the village bearing the hills name and further to the village of Alderley. A walk along the valley of Kilcott Mill and Lower Kilcott led me to my final climb of the day, this time to Long Coombe. At its end I reach another fine monument before finishing off my roller coaster day in the quiet rural village of Hawkesbury Upton. I was joined for the first half of today's walk by Mark Vines, a work colleague. Mark is a native of Gloucestershire so the journey to meet up with me in Dursley was not too much of a convenience for him. His Fiancée had dropped him off in the town and would pick him up later on in Wotton under Edge at about the half way point of today's walk. Mark was waiting patiently on a street bench opposite to my accommodation when I opened the front door and exited the premises. I was greeted by him and by a blistering sunny hot morning. "How is it going Mr B?" Mark asked. My reply was "Very well indeed Mark" as I was carrying anticipation and enthusiasm rather than aches and pains. 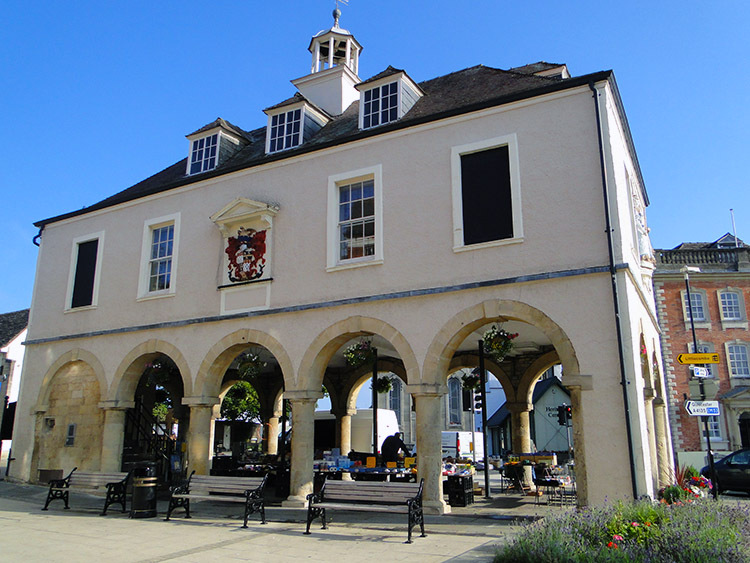 We walked from my digs through the centre of Dursley and past the impressive Market House which was already busy with traders setting up for the day at one minute before eight o'clock as we passed by. 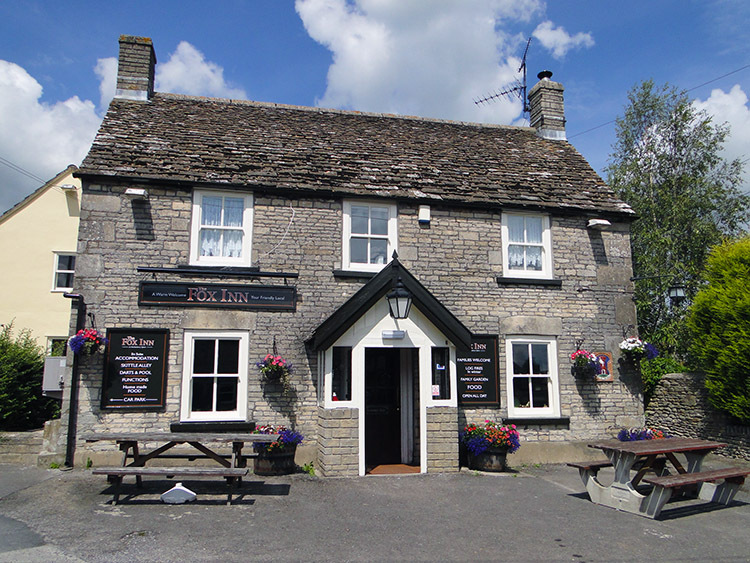 Soon we were climbing for the first time in the day by walking along May Lane and past the Old Spot Inn where I had enjoyed my Dursley evening. A plaque on a wall near the pub informed us that Dursley was written as Dersilege in the Domesday Book of 1086. It was then an agricultural settlement and remained so until weaving of woollen cloth became common, first in domestic homes and then in water powered mills. Mark and I carried on up the road which we soon left to follow a lane straight up the east facing bank of Stinchcombe Hill. We climbed over 100 metres in a kilometer, a 1:10 gradient. "You are doing well Mike, especially with that backpack" said Mark who is young and fit; he is a regular Iron Man Challenge competitor and good at it. "A lot fitter than I was when I set off in Scotland" I replied, trying to keep an unpained face as I did so. (The truth of the matter was that I was in fact as fit as I had been for years so my stamina was good and recovery time good also). We made it to the top of the hill in very good time. 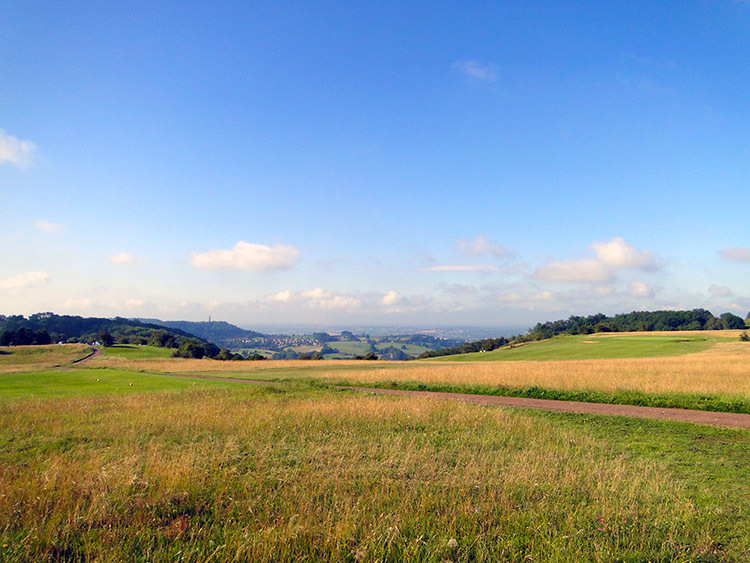 The Cotswold Way makes its way around the perimeter of Stinchcombe Hill in a kind of star shaped manner, all the way edging a golf course which sits directly on the top plateau of the hill. It is a weird arrangement of eighteen holes crammed in on the hill top. We did a full circuit of the course, the north side offering little of views from the escarpment as it is thickly wooded with trees on the edge. The south side was different though and the view from Drakestone Point over the Vale to the River Severn and Forest of Dean beyond and down the line of the M5 to Bristol was a cracker. The view due south from where we left the hill towards North Nibley was even better with Tyndale Monument dominating the scene and drawing us across the low farming ground of Doverte Brook towards it. Mark and I had noticed a sign fixed to the Cotswold Way on Stinchcombe Hill. It mentioned the 'Cotswolds-Korea Friendship Trail' and explained that a circular walk of Stinchcombe Hill was twinned with Route 3 of the Jeju Olle Trail, a continuous series of walking routes around the perimeter of an island 130 miles off the southwest coast of Korea. One for the bucket list perhaps? Banking the exotic notions and keeping to our immediate course Mark and I crossed a series of fields between Stinchcombe Hill and North Nibley. One was a large field of golden Barley. The path through the grain was a good one. 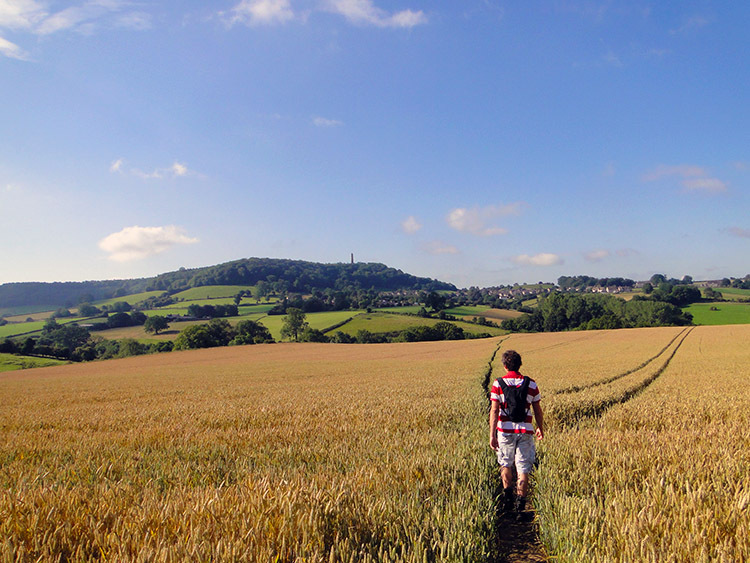 After the grain field we crossed Doverte Brook and climbed through fields of pasture to reach the village of North Nibley. 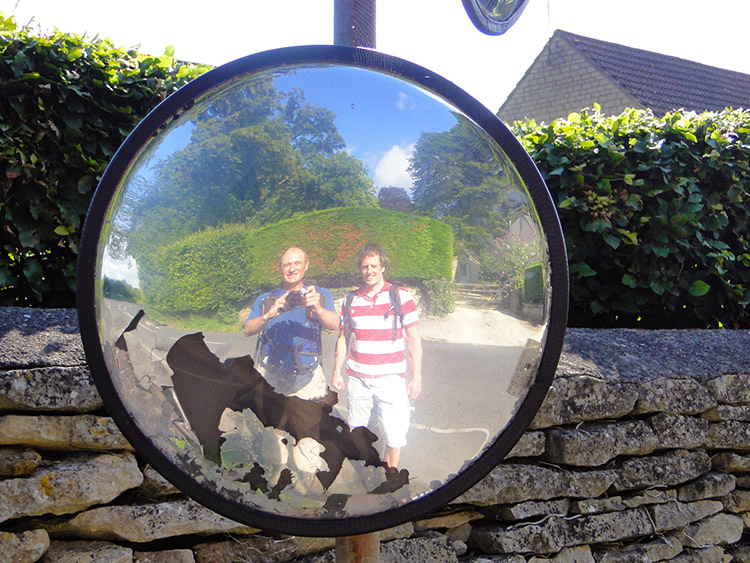 The climbing from the brook to North Nibley had been done in the sweltering heat of the midsummer morning and without any cover from the sun so I decided to treat Mark to an ice cream when we arrived in the village. If we could find a shop in the village that was and by observation of watching local people walk in the same direction unladen and in the opposite direction with Newspapers tucked under their arms and/ or with provisions I worked out where the local store was. There were a couple of ladies in the shop queuing before me and another couple of ladies outside the shop chatting. Mark waited outside while I waited my time to be served. After as minute or so I heard a lady exclaim "You cheeky monkey" which was followed by a giggle from the ladies. The shop door then opened and an elderly gentleman with a walking stick walked in and waited to be served. With ice creams in hand I walked out of the shop and joined Mark. The ladies were still there and all seemed fine while Mark and I enjoyed our ices. Then the old chap came out of the shop and tried to pat a lady gently on the bottom with his walking stick. It transpired this was normal behaviour which all parties accepted. "They enjoy a bit of attention" he said to us while winking and walking off. He smiled as he left. The ladies smiled at us and we smiled back. From North Nibley Mark and I had the steepest of climbs up the west bank of Nibley Knoll. It was only an 80 metre climb to the top but it was steep, enough so that the path was stepped all the way. We must have worked off plenty of the calories added by the ice creams by the time we reached the top of the hill. When we emerged from the darkness of the woodland enclosed climb we were standing right next to the Tyndale Monument. Before paying attention to the monument I was drawn to look out to the view south and west. The lovely morning weather was still with us and made the scene cast out before me very appealing. Nibley Knoll and the arch of the upland escarpment to Brackenbury Ditches which we would walk the length of meant the hill was a natural outdoor theatre with the view below the show. Set down before us were fields of pastoral England, Little Avon River, the pretty village of Charfield, Bristol and the Mouth of the Severn. After my fill of the view I paid attention to the impressive structure I was stood besides. 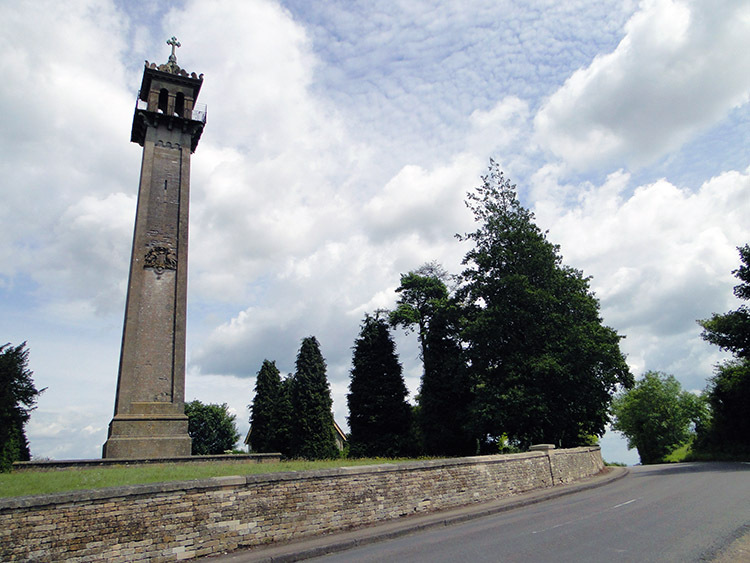 The Tyndale Monument is a hilltop tower which was built in honour of William Tyndale, a translator of the New Testament, who was born in Stinchcombe near Dursley. 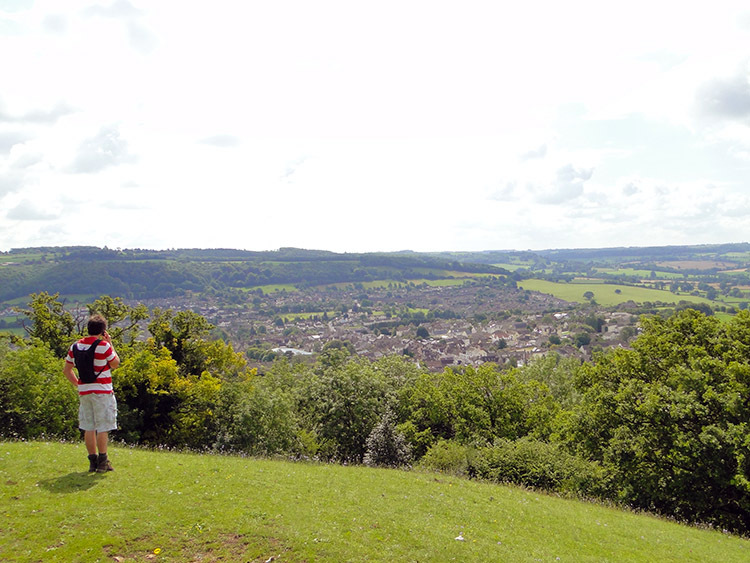 (Why was the monument not on Stinchcombe Hill? Did the golf course get there first?) The tower has a spiral staircase of 121 steps which Mark ran up. 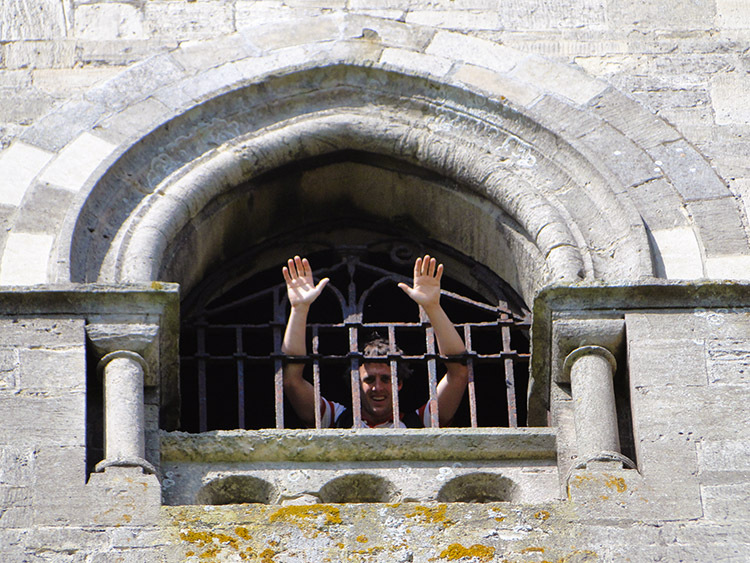 I declined, taking his picture from the top window instead. Mark and I left the site of Tyndale Monument on Nibley Knoll and followed the curve of the hill to reach Brackenbury Ditches, set on the edge of the hill with Westridge Wood covering the rest of the hilltop area. The Ditches or Camp as it is alternatively called is the site of yet another hill fort though it is difficult to see clearly due to all the woodland set upon it. The banks and depressions of Brackenbury Camp are not typical of the surrounding ground are clear enough though. Continuing on from the fort we found more recent evidence of human activity near the prehistoric camp. 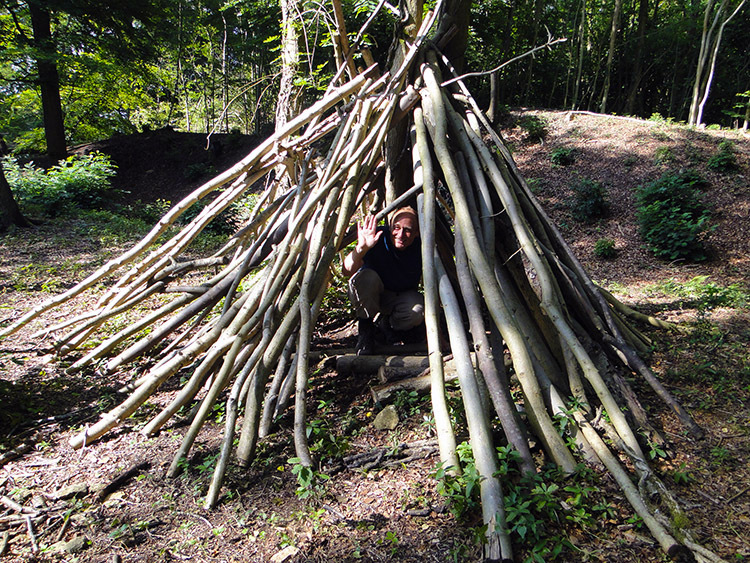 Temporary camps as a result of modern woodcraft. 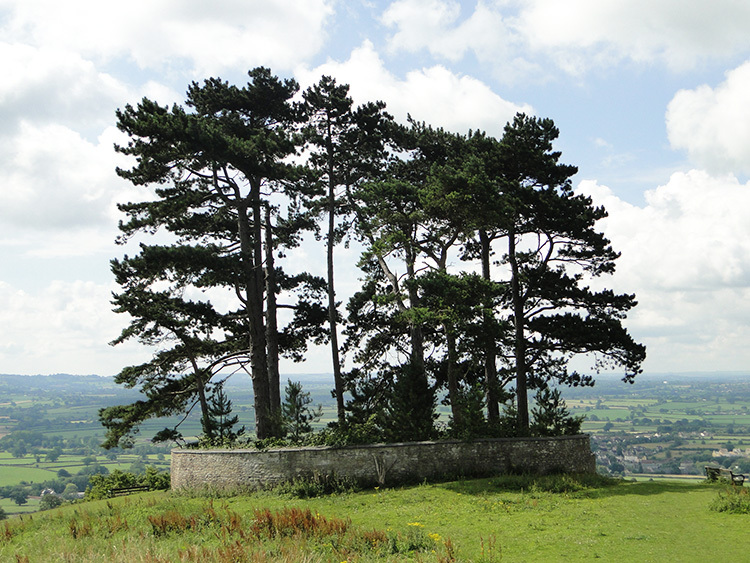 We continued our lovely summer morning walk to the edge of the Cotswold hill which we had climbed to at Tyndale's monument on Nibley Knoll. 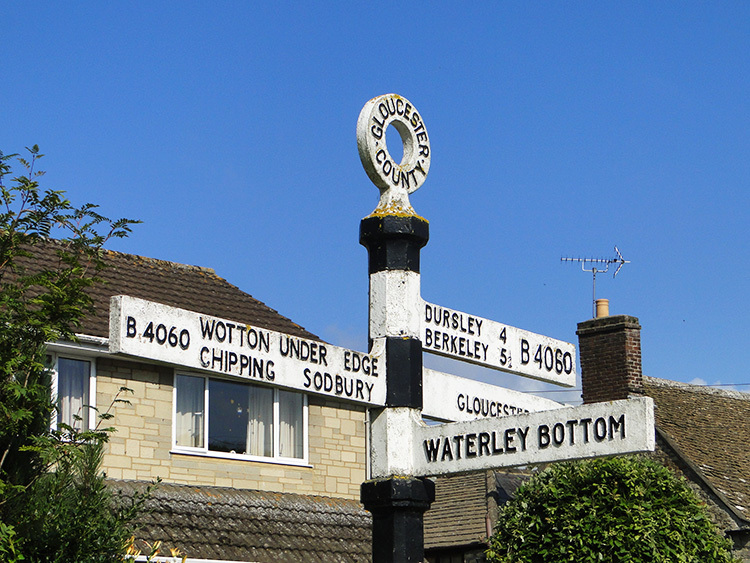 The end point was reached at Wotton Hill which fittingly looked straight down on Wotton under Edge. Sat on top of the hill was a strange walled enclosure. such enclosures are usually for managing livestock. Yet there was no livestock on the hill. This enclosure housed trees. The reason? Apparently trees were first planted on the site in 1815 to commemorate The Duke of Wellington's victory over Napoleon at Waterloo but with no protection from the weather they became weak and were felled for a bonfire. The walled enclosure was erected and the site replanted with trees to commemorate the Jubilee of Her late Majesty Queen Victoria in 1887 following the burning on this spot of one of a chain of celebration beacons which then spanned the country. The enclosure was last replanted with new trees in 1952. So the ones I were looking at were at few years older than me. Not many though! From the walled enclosure Mark and I walked from the hill into Wotton under Edge. In the town Mark and I stopped for a while to wait for his girlfriend to arrive and pick him up. We did not have to wait too long and one the young loves were reunited I thanked him for his company during the morning. It had been very enjoyable walking with him. 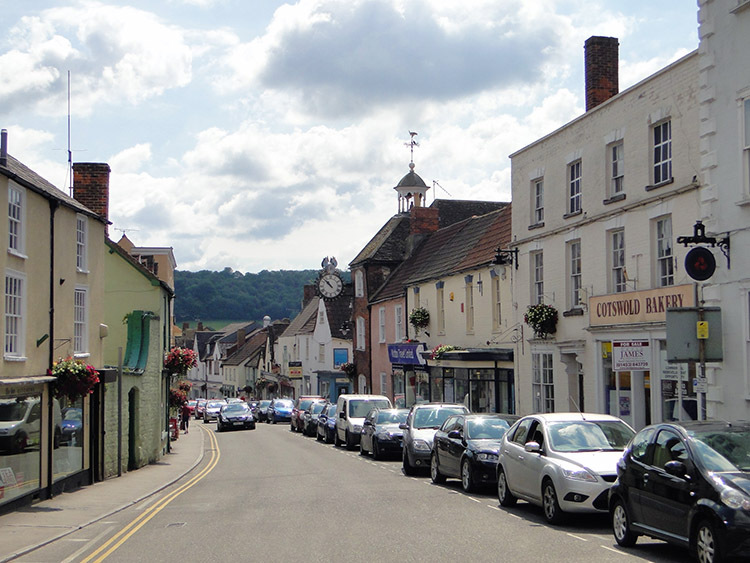 I took a little time in Wotton under Edge and looked around the town. It was a busy late Saturday morning and the main shopping streets were crammed with cars and busy with people. Just away from the shops the streets were much quieter. I came to a house with an inscription written into a wooden plaque above it. It was in old English and difficult to make out. I think it read "Which founder was Hugh Perrii, esquire and Alderman of the city of London who was borne in this towne and be sides this guift gave many other good guifts for the good of this towne. Anno Dominy 1638 H.P". The edge of the inscription had the wording "Gloria Deo Gratia Funda To Ri". From Wotton under Edge I followed lanes and then crossed a few fields before making my third significant climb of the day of 150 metres up Blackquarries Hill. 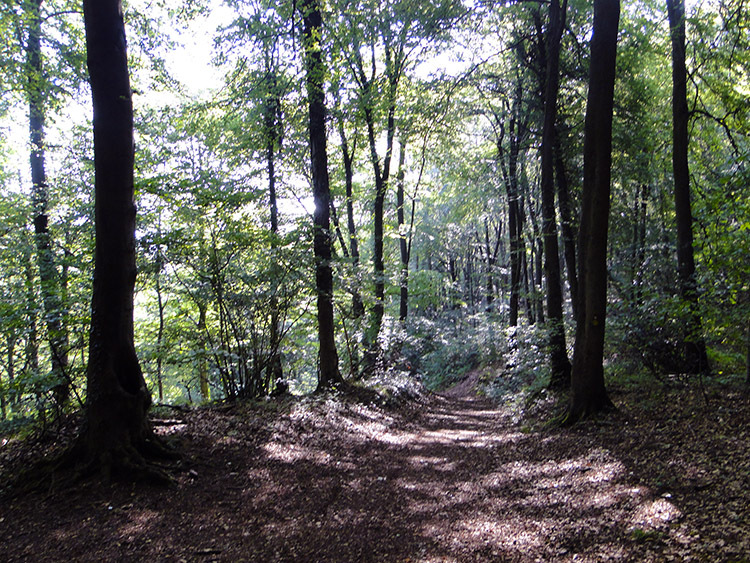 The climb was made along a quite country road which I left at the top of the hill to walk along a lane past an old quarry and then along a wooded escarpment edge to pass another disused quarry and reach Wortley Hill. From the hill I descended steeply through dense woodland and then crossed open farmland passing close to the village of Wortley and walking on a road through the village of Alderley without seeing anyone at all. It could have been a deserted village. Continuing on my lonesome track, surprisingly I had met few fellow Cotswold Way walkers at all in five days, I walked on the edge of about half a dozen fields before reaching another very quiet country road at Kilcott Mill which I followed eastwards to Lower Kilcott. 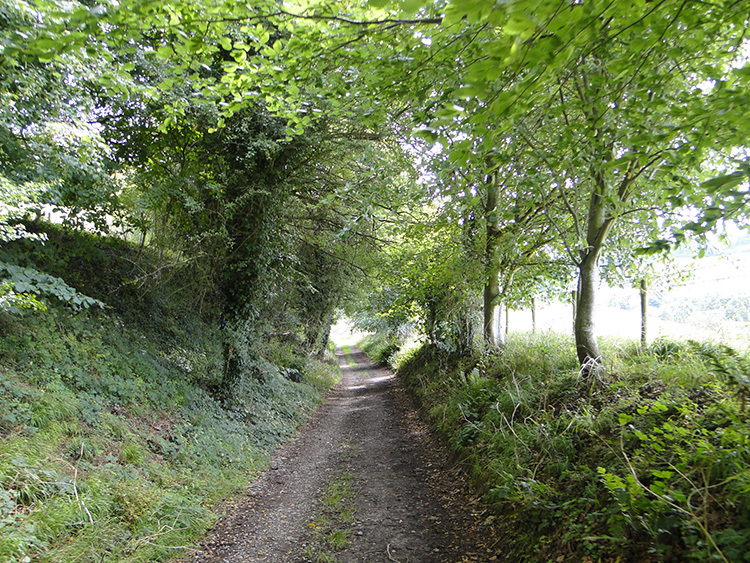 Walking along the lane I did see a group of people for the first time since I had left Wotton under Edge. They were fishing in a mill pond. 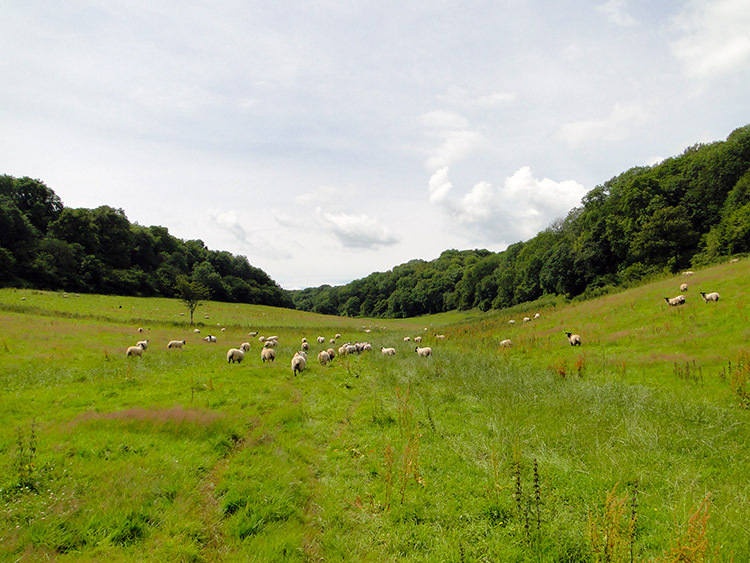 From Lower Kilcott I crossed a large field in the bowl of Long Coombe and Clay Hill. Sheep lolled about in the field chewing and not doing very much else at all. They only stirred into action if I got too close as I walked by them while on my last climb of my day towards Hawkesbury Knoll. After crossing the field I followed a lane through woodland to emerge at a road and beside a monument which looked very similar to the one dedicated to William Tyndale. I discovered I was looking at the Somerset Monument. 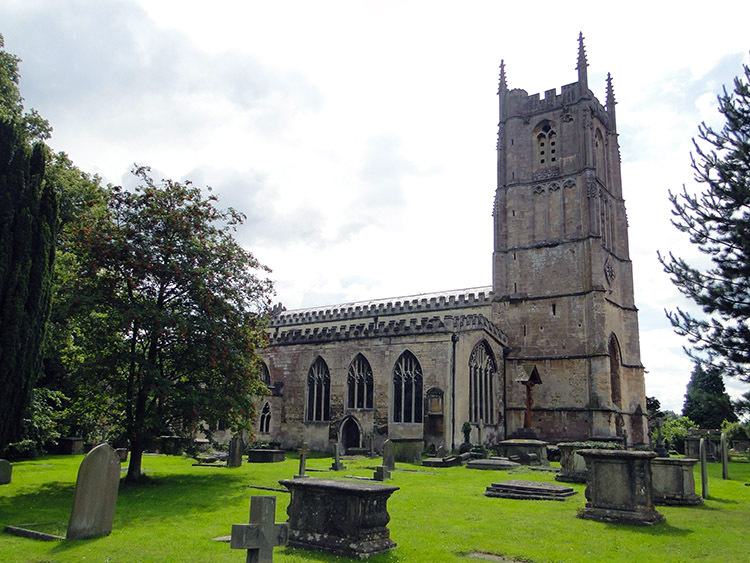 It was erected in to commemorate Lord Edward Somerset, a decorated British soldier who fought during the Peninsular War and at the Battle of Waterloo. I had a good look around the monument which marked the end of my day on the Cotswold Way. I had to walk on into Hawkesbury Upton where my accommodation for the evening awaited, a delightful walk downhill in sunshine which had returned after a midday lull. My whole day had been delightful, the first half with Mark on the last of the high escarpments of the Cotswold Hills where views were far and wide and the second half in quiet serenity on isolated lanes, trails, woodland paths and quiet roads. 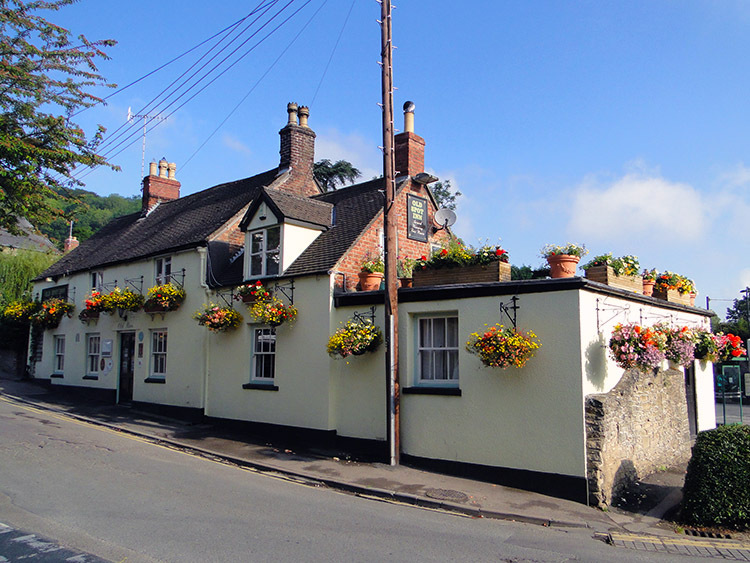 I was cheered as I walked into Hawkesbury Upton and when in the heart of the village I found my accommodation at the Fox, the village's only pub. It was a lovely inn and I thoroughly enjoyed my stay in my room and my night in the pub during which I talked with some very friendly local people. What saddened me though was discovering from my hosts and evening friends was the plight of the pub which may soon have to close down. I learned that if trade did not significantly improve it would be closed by year end. That was a sad thought to end a super day. I loved the friendly atmosphere of the pretty local inn and loathed the thought of it ending a local association of sociality by being turned into private dwellings. (Note: I am happy to say that despite the pub closing down soon after my visit it was saved from development and reinvented. It was still a thriving local business at time of the writing, June 2017. Flavours of Italy adds a flavour of the Mediterranean to Hawkesbury Upton and to the Cotswold Way. Well done to all concerned).